Print boxes are perfect for carrying and protecting your wallet size photos. Choose from three styles of print boxes to hold your senior wallet size photos - they are all great for protecting your prints. The paper box is included FREE with every die-cut wallet photo order, or you can upgrade to a Premium two-piece box, or our Deluxe Plastic Wallet Box. Our wallet print boxes make it easy to carry and pass your wallet size photos out to your friends and family. Deluxe wallet box with a black base and hinged clear plastic lid lets you see your wallet photos and protects them from handling. Holds 72 wallet size photos. NEW! - Premium Wallet Box. 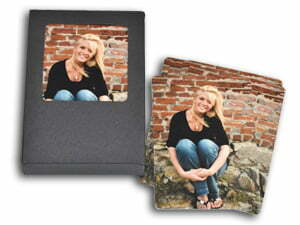 This two piece box is made of sturdy fiber board, and will hold 96 wallet size photos. Rich chocolate brown, with matching elastic bow. This wallet photo box is free with any die-cut wallet photo order. This sturdy black cardboard box features a window opening to see your prints. Tip: You can add a wallet box along with your wallet size photos when you place your order online - simply upload at least one picture to get started.